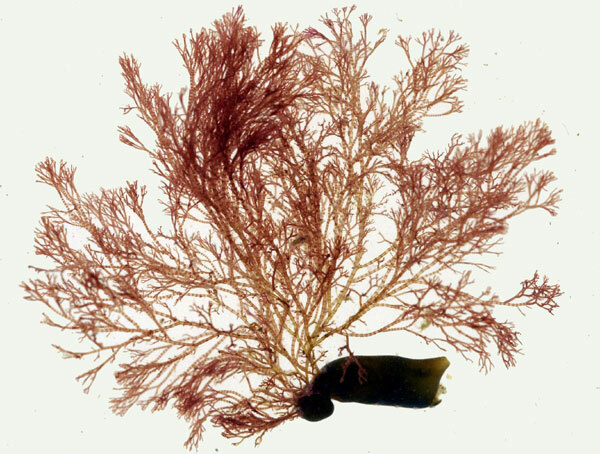 Description: Cartilaginous, usually bushy, brownish red to yellowish green fronds, to 300 mm long. Irregularly dichotomous, clothed with simple to repeatedly dichotomous ramuli. Usually completely coticated, branchlets markedly narrower than main axes, apices normally markedly hooked inwards (but straight in plants bearing tetrasporangia). Very variable in size, form and colour. Habitat: On rock, shells and epiphytic, intertidal and shallow subtidal, generally distributed, abundant, one of the most ubiquitous marine algae in the north-eastern Atlantic. Site © M.D. Guiry 2000 - 2019. Important copyright notice: all text, design and photographs on this site are copyrighted by M.D. Guiry unless otherwise stated and all rights are strictly reserved. Click here for copyright information and contact. Website design: 249 Design Studio. Site maintained by M.D. Guiry (michael.guiry@nuigalway.ie). There have been 8736589 page loads since 1 January 2014 on 25 April 2019.